3 January 2018 Dublin, Ireland – Ireland Lacrosse is proud to announce the selection of the 2018 Men’s National Lacrosse Team. 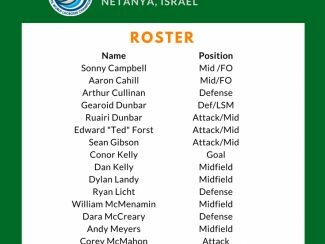 The team will represent Ireland at the Federation of International Lacrosse’s World Championships being held in Netanya, Israel 12-21 July 2018. The 23-man squad is comprised of seventeen veteran players, who have represented Ireland on the international stage in prior tournaments. They are joined by six newcomers to the program. Ireland will be competing in it’s 5th Men’s World Lacrosse Championship. 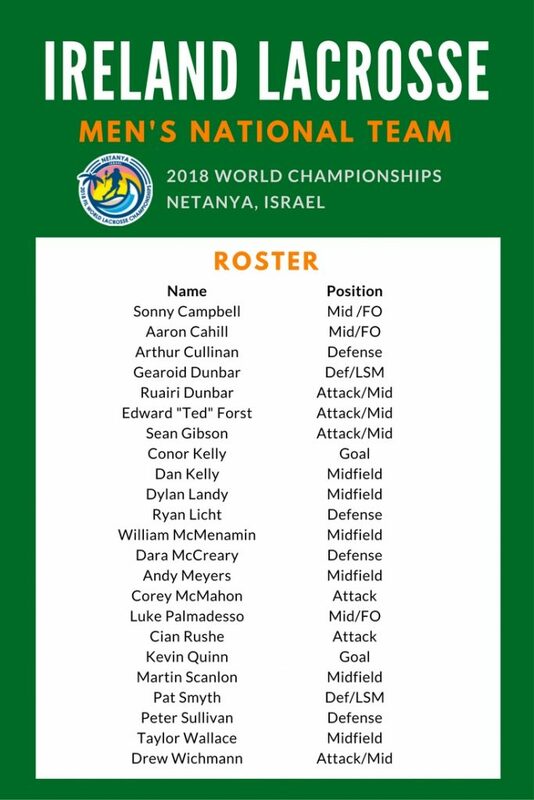 Six players return from the 2014 National Team which placed 10th at the FIL World Championship in Denver, USA: Sonny Campbell, Aaron Cahill, Sean Gibson, Ryan Licht, Kevin Quinn and Martin Scanlon. Ryan Licht will be competing in his eight field tournament, coming in with 43 caps. Sean Gibson will represent Ireland in his 13th international tournament, far in the lead with 70 caps. The 2018 Men’s National Team will be coached by Chris Arnold, assisted by Matt Curran, Jeremy Platt and Sean Bodie. You will be able to follow the day-to-day activities and get in-game updates via the Ireland Men’s Lacrosse twitter account: @IrelandMLax. More information on the tournament can be found at http://worldlacrosse2018.com. Ireland Lacrosse seeking Team Manager(s) for national & national development teams! Tomas (Miagh) Meade 18 yo Freshman at Vassar College interested in knowing how to get on the Irish National team.